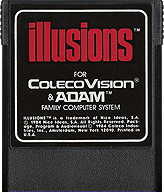 ColecoVision.dk presents: illusions © 1984 by: Nice Ideas. S.A. France. 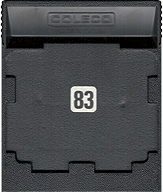 Initially © and Licenses: Mattel Electronics, Nice Ideas S.A. France, Coleco Inc.
ColecoVision Manual # and Manufacturer: 300270, The Key: 300271 Coleco Inc.
ColecoVision Box # and Manufacturer: 76930 20875, Ivy Hill- Terre Haute July 1985 U.S.A.
"A Surreal Game Of Strategy !" Gleebs. They're optical illusions you've met in your dreams. Now they're waiting to take a trip through your mind. Without the basic directions, (like left & right & up & down!). On their journey, Gleebswill battle theirlizard foes with buckets of water. They'll climb endless stairs endlessly. defying physics, they'll join and part. All with one goal in mind: To pass through mirrors from one world to the other. It's more fun just to share their crazy world for a while. You'll see that sinister lizard turn into a fish into a bird. But you may not believe your eyes when you see it. Because that's what illusions are all about. Right ? Left ? Maybe ? High Score For The ColecoVision Version Of: illusions, Skill Level: 1. XName: Ryan Gavigan. XName: Name: Ole Nielsen. 1st XScore: 15.170 - September 15, 2003. 1st XScore: 0 - 1st XScore: 300 - January, 08 2015. 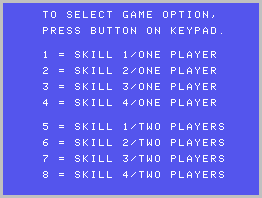 High Score For The ColecoVision Version Of: illusions, Skill Level: 2. High Score For The ColecoVision Version Of: illusions, Skill Level: 3. High Score For The ColecoVision Version Of: illusions, Skill Level: 4. ColecoVision.dk Game # 83, illusions is last updated: February 26, 2019.